Osaka is lively and exciting city and famous for its friendly and spirited citizens. 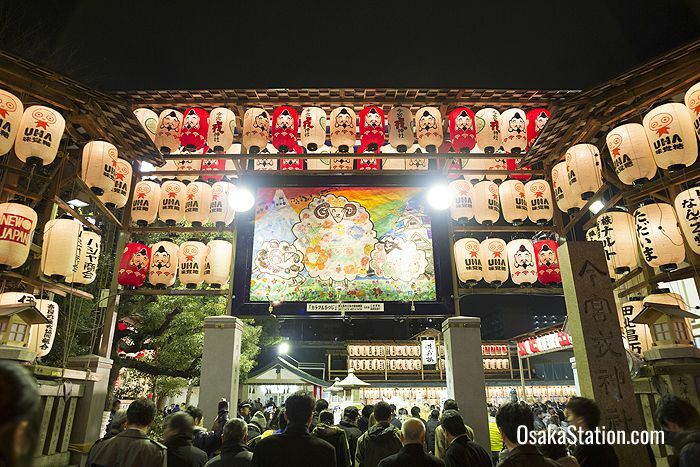 However, when Osaka holds a festival, it really comes alive with joyful energy and exuberant celebrations. For a really memorable trip to Osaka, try to catch one of these unique local festivals. From the 9th to the 11th of January the people of Osaka flock to Imamiya Ebisu Jinja Shrine to pray to Ebisu, the god of good fortune. In particular, Ebisu is seen as the god of commercial prosperity and in an enterprising city like Osaka that is very important. People pray at the shrine for success in their work and business during the coming year and they buy lucky bamboo grass and many other lucky charms. Ebisu is also the god of fishermen, and is often depicted holding a large bream under his arm because bream is seen as a fish for celebrations. For this reason on the morning of the tenth (“toka” in Japanese), there is a large fish market with lots of bream on sale. The major event though is a colorful parade, also on the morning of the tenth, with costumed celebrities, geisha, and fuku-musume or “lucky maidens”. Throughout the festival, the streets around the shrine are closed to traffic, stalls are set up selling all kinds of edible snacks, drinks, and treats and there is a really merry carnival atmosphere. The Doya Doya ritual at Shitennoji Temple is possibly Osaka’s strangest festival. Crowds of young men brave the cold wearing only loincloths that look very much like ritual nappies. As they jog into the temple they are purified by being showered with cold water. Once inside the temple they struggle to catch lucky paper charms that are dropped from the ceiling. Dressing the young men like babies and ritually washing them is meant to cleanse their minds and revive them for the coming year. Once the cherry blossom season arrives, spring has officially begun, so everyone spreads out their picnic blankets and celebrates under the trees. The cherry blossoms in Osaka usually start to bloom in late March and continue until mid-April, but you can check the cherry blossom forecast for each year’s dates. 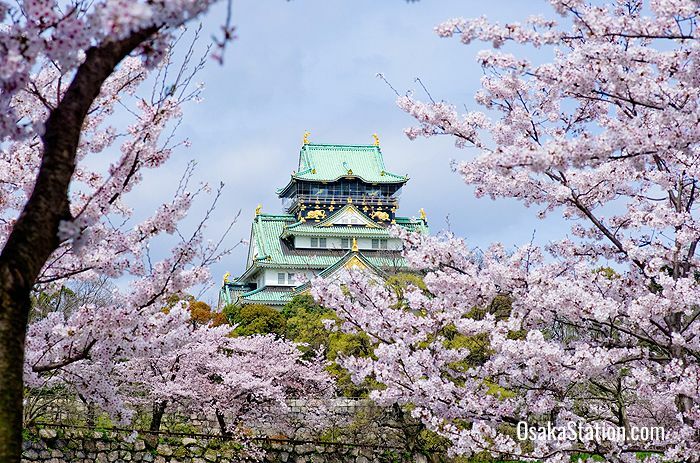 Here are the best places to enjoy the cherry blossom, or sakura, in Osaka. Osaka Castle Park is always a popular hanami spot. The sight of the white castle framed by pink blossom is picture-perfect, and it is also illuminated at night. Kema Sakuranomiya Koen Park is a peaceful riverside park with 4,700 cherry trees. There are benches and strolling paths and plenty of space for picnics. Expo 70 Commemorative Park is a little out of the way but you can take the Osaka Monorail to get there and it is totally worth it. This park has 5,000 cherry trees which are illuminated in the evenings. Tsurumi Ryokuchi Park was the site of the Flower Exposition in 1990, is now a bird watcher’s paradise, and has many beautiful gardens with seasonal floral displays. In early April this expansive park becomes another perfect picnic spot with many blooming trees. Osaka Mint Museum has 300 late-blooming double-petaled cherry trees which usually bloom in mid-to-late April. The grounds are opened for one week when the blossoms are at their best and illuminated at night. This is a good spot to go to if you missed the main sakura season. Tenjin Matsuri is one of Japan’s biggest festivals and it dates back to the 10th century. It is held to celebrate the Shinto god of learning, Tenman-Tenjin at Osaka Tenmangu Shrine. Various rituals and prayers of preparation are held at the shrine on the 24th along with a taiko drum performance. 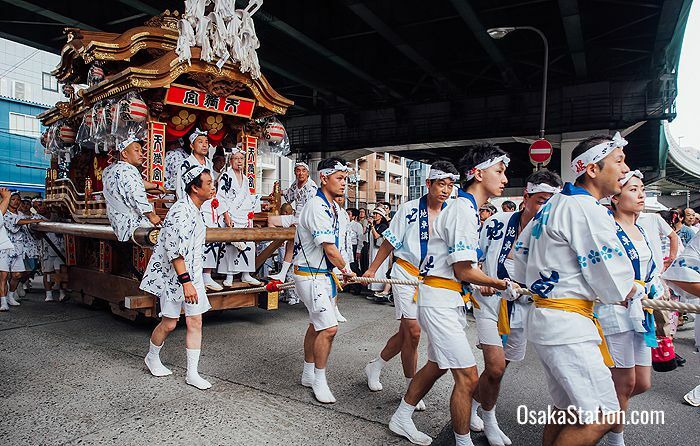 However, the main events take place on the 25th when portable shrines are paraded through the streets as part of a colorful procession along with 3,000 costumed participants. This is followed by a boat parade on the Okawa river with 100 boats, some carry portable shrines and others carry kabuki performers, or bunraku puppet shows. In the evening the boats are lit with torches and the festival climaxes with a fantastic fireworks display. Throughout the festival the riverbanks are packed with stalls selling festival foods and drinks, so this festival really feels like a big street-party. 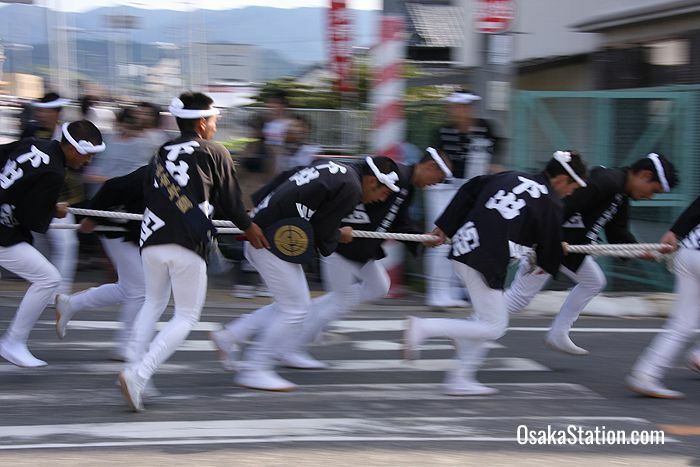 Danjiri or float-pulling festivals are held at various locations in Japan, but the most famous (and probably most dangerous) is the one held in Osaka’s Kishiwada town. Large and elaborately carved wooden floats are pulled at high speed through the streets with costumed men hopping and posing on top. All of this action is accompanied by ritual shouts and music from gongs, flutes, and drums. Each float represents a different competing district and the teams that pull them are very keen to prove that their district is the best. For this reason they rush fearlessly through the streets, taking corners at frightening speeds, and it is not unusual for people to be hurt. In the past people have even been killed taking part in this festival, so if you want to see a truly dramatic and thrilling festival, this one is for you! Article by Michael Lambe. Photos by shiroyagi, skylight, pnakrong, minamisea. All rights reserved.